What if the answer to solving most of your money problems was all in your head? According to the field of behavioral economics, humans are practically hard-wired to overspend and let their emotions steer their financial decisions (often in the wrong direction). The pull of our emotions can be so strong that even when facts are presented clearly to us — we must save for retirement, we must not spend more than we earn — again and again, we find ourselves falling short. In “THINKING MONEY: The Psychology Behind our Best and Worst Financial Decisions,” a new documentary that aired on public television this week, a team of behavioral economists and financial experts help pick apart the human brain in an effort to reveal exactly how it can so often work against us — and what we can do to stop it. How does the IRS pick Tax returns for audit? An area where most small business owners get into trouble is classifying their employees. There is a 20 point test run by the IRS that every employer should use to determine whether or not their employee is an independent contractor or a real employee. For employees that are considered independent contractors, Form 1099 should be filled out properly and only when an employee meets the 20 point test to be considered an independent contractor. Since independent contractor wages are not subject to state, local or social security tax through the employer, many small businesses have fall victim to hefty fines for classifying employees as independent contractors rather than employees. A letter from the IRS doesn’t mean you are necessarily being Audited , sometimes the agency is looking for more information or clarification. First thing to do is to determine what part of your tax the IRS is looking for clarification on. IRS auditors will have questions on a portion of the tax return–not the entire thing. Many times you are getting selected because the IRS doesn’t have a lot of information about you. If you have kept records, including bills, receipts, and canceled checks, you shouldn’t worry. The IRS may end up interpreting your situation differently than you, but there is no crime in having differences of opinion. Nevertheless, professional help may be in order with an office audit, particularly if you yourself suspect that there are errors or omissions in your tax return. NEW YORK (MarketWatch) — There’s a Wall Street trading axiom, that the more people who believe in a specific scenario, the less likely that scenario will play out. So if more than 70% of so-called “smart money” investors expect the S&P 500 to pull back slightly into October, then rally to a new high by year’s end, does that mean the market won’t dip, or that it won’t recover? Sterne Agee chief market technician Carter Braxton Worth said don’t be so quick to bet against the crowd. He’s learned from surveys of market professionals over the years that the correct scenario tends to be either the clear consensus, or the extreme outlier. If that plays out again this year, investors should either wait about a month before buying, or just buy now. Either way, investors could be in a pretty good mood on New Years Eve. In his latest poll, Worth surveyed 492 market professionals, including portfolio managers, analysts, traders and high-net-worth individuals, asking which of the six market scenarios he provided they believed the S&P 500 SPX, +0.49% will follow through the end of the year. These days, for a variety of reasons, more people are choosing to freelance full-time or to bring in income on the side. Freelancers Union counts 42 million independent workers in the U.S. One in three working Americans is an independent worker. The one thing you can bank on in self-employment is that your business will slow down at some point. While you can use times like these to market yourself, by Social Media,or networking, for example, these activities don’t address your immediate financial needs. Don’t panic, but do go into financial lock down mode. Avoid rash behavior and unnecessary spending, and find any reasonable ways to bring in some supplemental income. If you don’t already use a budget, this is the time to craft one. If you’re a freelancer and depend on that income to make ends meet, then there is no time like the present to get a clear handle on your money situation. Starting a budget from scratch when you have a fluctuating income presents a special challenge. A minimum-needs budget allows you to pay all your bills, closely monitor all non-mandatory spending, and also hit your savings goals. The key is to quantify each lower level goal. For example, saving for retirement while living on a fluctuating income is certainly possible –- you just have to work harder at it. Just as any entrepreneur will tell you there are going to be lean times, there are also going to be good times that will tempt you to overspend. Avoid that temptation as much as possible. Apply your surging income to the goals you have set in your minimum-needs budget. Top off your emergency fund (three to six months of living expenses). Put more toward saving for college if you have children. Contribute to your Retirement Plan. The point is to make those extra funds work for you in the best way possible. When you’re a freelancer don’t get caught wishing during a slow time that you had managed money more wisely. You want to use those good times to hit stretch goals you have established for yourself and and the future of your business. Small businesses need more than bookkeeping and CFO Rick can help you save money, improve operational costs, bring on new employees, and manage the state and federal government. You do what you are good at and CFO Rick will watch your back. Call CFO Rick today at 415-821-0985 or contact us at http://www.cforick.com/contact_us.php. 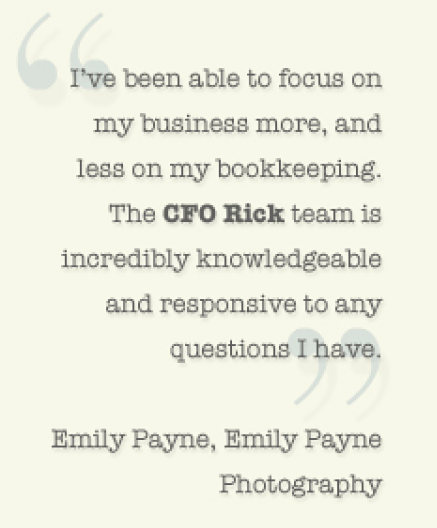 If you mention this post, CFO Rick will take 10% off your first six months of services. Cash – in savings accounts, short-term CDs or money market deposits – is great for an emergency fund. But to fulfill a long-term investment goal like funding your retirement, consider buying stocks. The more distant your financial target, the longer inflation will gnaw at the purchasing power of your money. People view money VERY differently. They manage it differently, spend it, save it, and invest it differently; they also view debt and investment risk differently. Common financial feuds between married couples today includes: spending everything you make, versus saving, differing views on where to invest your money, and debt. Goals: These are both short and long term goals. Such as, when do you want to buy your first home? How much money do you want to start saving for traveling or retirement? By bringing your financial hopes and goals to the table, you can reach a SHARED financial vision for the future. Budget: Create a budget together. Knowing in advance how much money you can each spend and how much to apply to your agreed upon budget, will greatly decrease the risk of financial feuds down the road. Estate planning: Good estate planning documents are not only for the rich and famous, or the wealthy. Whether you’re single, widowed, or marrying, it’s important to create and update your will, living trust, insurance policies, power of attorney documents, beneficiary designations and any other financial accounts you may have. Also, getting married is one of the life events that allow you to change your health insurance election without waiting for the open enrollment period, so use this time wisely. Retirement Planning: Whether you’re getting married earlier or later in life, retirement planning is something you should prepare for as early as possible. Evaluate your current financial situation, as well as the time you envision yourself and your spouse retiring, and discuss how much of your money should be put away and invested into a retirement account each month. There is no one size fits all solution for how to handle money in a relationship. You have to find what works best for you and your partner. A good financial counselor or other independent party may help you to bridge the gap, and build a better financial life together.